Now that the staff of Insight Observatory has their ATEO Portal working to its full capacity, they looked up a few unique deep-sky wonders to image remotely via their newly released remote telescope gateway. Insight Observatory Project Developer, Michael Petrasko chose IC 1805, The "Heart Nebula" as a target to script in the online application. This access portal to Insight Observatory's remote robotic telescope network located at an elevation of 7,800 ft. in western New Mexico is now available for use to educators, students, and the general public. Currently only ATEO-1, the 16" f/3.7 Dreamscope Astrograph reflector imaging telescope is accessible through the ATEO portal. However, ATEO-2, the Williams Optics 5" f/7 refractor is available for imaging through Insight Observatory's Educational Image Request form (EIR) and their Public Image Request form (PIR). ATEO-2 is slated to be available on the portal within the next couple of months. 3 x Luminance at 300 seconds, 3 x Red, Green, Blue at 120 seconds. The Heart Nebula (IC 1805) is an emission nebula located at an approximate distance of 7,500 light years from Earth, in the constellation Cassiopeia. It is also known as Sharpless 2-190 (Sh2-190) or the Running Dog Nebula because, when seen through a telescope, it resembles a dog running. The nebula has an apparent magnitude of 18.3 and an absolute magnitude of 6.5. 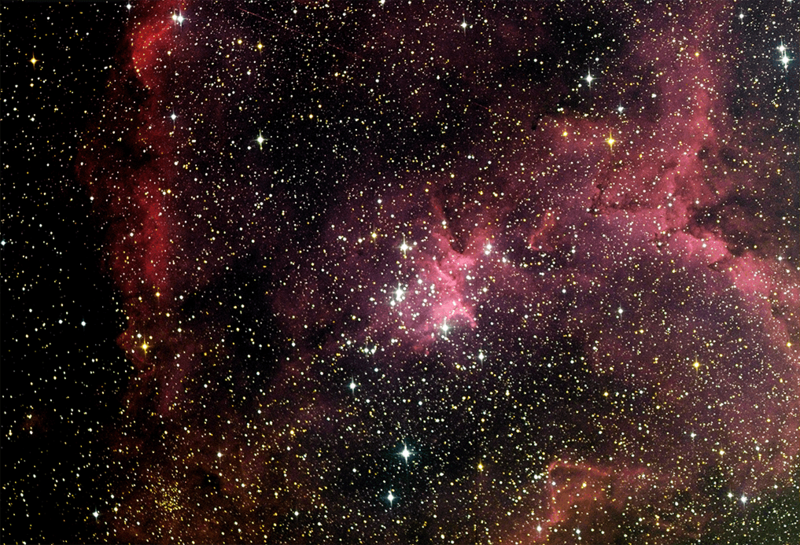 It is 150 arcminutes in size and known for its intensely red glowing gas and dark dust lanes forming a shape that resembles a heart symbol. It was discovered by William Herschel on November 3rd, 1787. The very brightest part of this nebula (the knot at the western edge) is separately classified as NGC 896 because it was the first part of this nebula to be discovered. The Heart Nebula forms a famous complex known as the Heart and Soul with its smaller neighbor Westerhout 5, also known as the Soul Nebula, which lies just 2.5 degrees to the southeast. Educators, students, and the general public interested in accessing Insight Observatory's online-remote telescopes to image deep-sky gems like this one may register for a portal account at https://ateodev.insightobs.com. They may also view ATEO Portal registration instructions on Insight Observatory's YouTube channel video below.